Current estimates suggest that forty to fifty percent of marriages will end in separation. Couples are struggling to maintain intimacy amidst hectic careers, raising children, and lack of knowledge on how to improve their marriage. Every couple wants to live happily ever after, but wives and husbands often repeat common mistakes and end up with intimacy-challenged marriages. It won't be too long before their "okay" marriage is a "bad" marriage, and divorce is a serious option. But there is hope! Dr. David E. Clarke, says couples can rejuvenate their marriages and discover the deep bond God wants them to enjoy. He shows them how they created an okay but boring marriage, and how they can fix intimacy-killing mistakes. 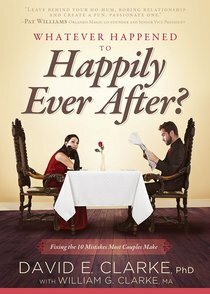 As couples read this book and improve their marriage, they will begin to enjoy the journey to happily ever after. About "What Happened to Happily Ever After?"